When you import your mail from Outlook Express to Windows Mail on a system where both programs are installed and configured is very simple in that all you have to do is open Windows Mail and use the import feature. Windows Mail will automatically locate and import all your Outlook Express mail and settings in one shot. However, if you’re simply wishing to import your mail from a different source (like an external backup), you have to do a few things to get it to work properly. 2. Now that you know where the files are stored, open that file location and copy the entire contents of this folder to a source you’ll be using on the new computer to perform the import. 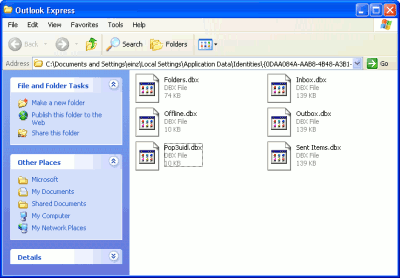 You’ll see a series of .dbx files designating your different folders (Inbox, Outbox, etc.). 3. Once you have all these files backed up, open Windows Mail on the new computer and following these steps. Click the File menu, point to Import, and then click Messages. Click Microsoft Outlook Express 6, and then click Next. Make sure Import mail from an OE6 store directory is selected, and then click OK.
Click Select Folder, and then click Next. Click All folders to import all the folders, or click Selected folders and select which message folders you want to import, and then click Next. I’ve had experience with the process being problematic in the past when you try and locate the store folders you backed up and when you click the right location, it places the path into the import field, but when you click Next, it tells you that it can’t find any Outlook Express data. If you now look at the path, you’ll see that Windows Mail has placed a second Outlook Express folder into it. I’m not sure how or why this happens, but its simple to fix. 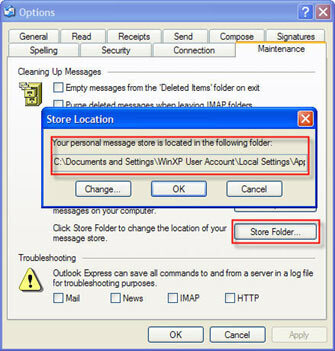 You just need to go to your backup location and create a second Outlook Express folder and place the data into it. This must be done with the import window still open. When you go back to it, just click Next and it’ll now find the right data! All that’s left to do is wait for the import to finish and then you can import your contacts. Check out the guide to importing Outlook Express into Outlook if you need help there too.